Mission-Inspired Design with a Dark Artisan Oak Finish Fits with Transitional & Tradit..
Natural Oak Stain Finish with Burnished Knobs Traditional Designs with Natural Characteristics ..
Rustic Oak Stain Finish with Burnished Knobs Traditional Designs with Natural Characteristics l..
Creamy White Finish with Painted Wooden Knobs Fresh Cottage Styling with Louver Accents & T.. Historical Perspective combined with Today's Lifestyle Designer-Style, Quality Construction &am..
English Country Bed that Captures Old World Style Updated Mineral-Gray Finish with Classic Turn..
Burnished Caramel Finish Aged Pewter Finished Handles & Knobs Full Extension Metal Drawer.. Distressed Black Finish Rosette Knobs in an Old Brass Finish Full Extension Metal Drawer Gild..
Rich Merlot Finish Round Top Corners & Breakfront Center Drawers Full Extension Metal Dra.. Transitional Design with an Elegant Country Flair Upholstered Bedframe Features Neutral-Tone Fa..
Radiant Satin Black Finish. 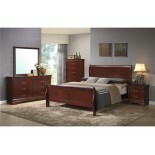 Case Pieces have Dust Proof Bottoms with Dovetail Construction..
Rich Cherry Semi-Gloss Lacquer Finish. Beautiful Pine Wood Moldings Featured Throughout the Cas..
Rich Espresso Finish Ample Storage Options Provided with Storage Headboard, Rails & Footboa..
Rich Semi-Gloss Espresso Finish Tall Upholstered Headboard with a Unique Taupe Fabric with a St..